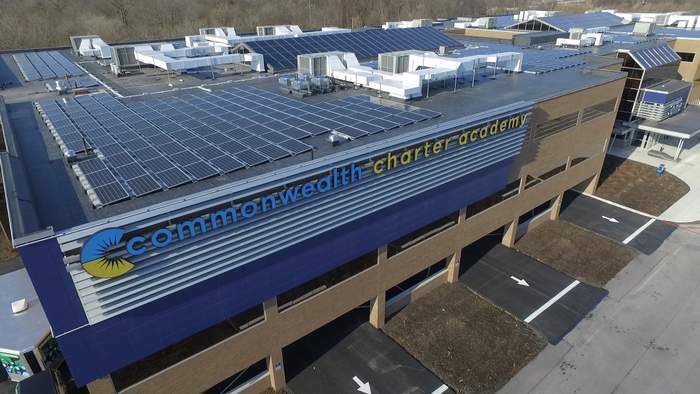 Commonwealth Charter Academy (CCA), a Pennsylvania public cyber school, partnered with a Pennsylvania renewable energy developer to install more than 1,000 solar panels at CCA’s Capital Campus. As part of the school’s commitment to improving sustainability and to minimizing its carbon footprint, CCA worked with Solar Renewable Energy LLC to equip its Harrisburg office with 1,080 solar panels that will produce approximately 500,000 annual kilowatt hours – the energy equivalent of 437,000 pounds of burned coal. This eco-friendly annual power generation will support one-third of the electricity consumption at CCA’s 180,000-square-foot Capital Campus, resulting in an estimated savings of $60,000 a year. Partnering with Pennsylvania companies is important to CCA. The school identified Solar Renewable Energy, LLC as a company that could construct and install the solar array, which includes SolarEdge optimizers to maximize power generation. CCA’s zero-waste aquaponics learning center, AgWorks at CCA, will be 100 percent powered by the renewable energy generated from the solar array. CCA students will be able to learn about power generation through a digital dashboard that will monitor the energy produced by the solar array system. Solar Renewable Energy, LLC assisted CCA in earning a state grant in the amount of $213,000 to apply toward the solar array system. CCA has entered into a power service agreement with a Solar Renewable Energy entity in which CCA plans to fully purchase and take ownership of the system after six years. Recent renovations to CCA’s Capital Campus also included the installation of energy-efficient lighting to reduce costs. Masonic Village at Elizabethtown, Pa., is in the midst of constructing a 2 MW solar system, adding to an existing 1 MW solar array. Once the project is complete in February, after more than a decade of investing in clean energy, the not-for-profit continuing care retirement community will produce 23-25 percent of its electricity using a mix of solar panels and microturbines. The array will be one of the largest solar arrays of any retirement community in the United States, and it will save Masonic Village $250,000 annually in electricity costs. The expansion will produce 2.2 million kWh per year and is expected to save $200,000 a year in electricity costs. In 2011, Masonic Village constructed a 1 MW ground-mounted solar photovoltaic system, which produces approximately 1.2 million kWh of electricity per year and results in costs savings of between $40,000 and $60,000 annually. Combined with the new addition, the system will produce approximately 15 percent of the campus’ electricity, and generate a rate of return of between 14 and 20 percent. As part of a production sharing agreement with Solar Renewable Energy LLC, Masonic Village will invest approximately $1.8 million in the expansion over six years. 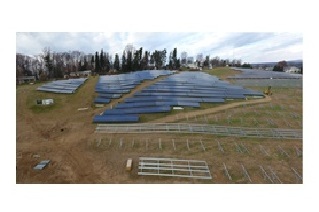 Solar Renewable Energy will finance the remainder of the project costs and will remain the owner of the array for six years, after which Masonic Village will have the option to purchase the system. After completing an energy benchmarking study last year, Masonic Village determined that energy costs between 2009 and 2015 decreased by 15 percent while the campus grew by 9.4 percent. Microturbines currently generate 10 percent of the campus’ electricity. The heat created as a by-product of the microturbines, in turn, heats water for a portion of resident apartments and the Masonic Health Care Center, reducing the use of gas boilers. Five microturbines were installed in 2002 (with a sixth added in 2010) and upgraded in 2007. The turbines reduce emissions by as much as planting 1,000 acres of forest per year. Clean energy is part of Masonic Villages’ four-legged energy efficiency plan, the other legs being conservation, efficiency and smart technology. Other efforts include the use of environmentally-friendly materials and methods at all five of its Pennsylvania campuses, including water and electricity-saving fixtures, co-generating electricity, motion detector-controlled lights and the purchase of hybrid vehicles for company use. Staff constantly evaluate new technologies, such as solar light tubes and LED replacements for standard streetlights.